In July 2015, fabulous news from the Cville TimeBank arrived in my inbox. They’d won a spot in New Dream’s Get2gether Neighborhood Challenge to raise funds for a community-wide Repair Café in Charlottesville, Virginia. I was thrilled! It’s a beautiful concept: neighbors help each other keep useful things out of the landfill and avoid buying more stuff. No wonder the idea has spread like wildfire, from the first repair café in Amsterdam in 2009 to more than 1,500 worldwide today. 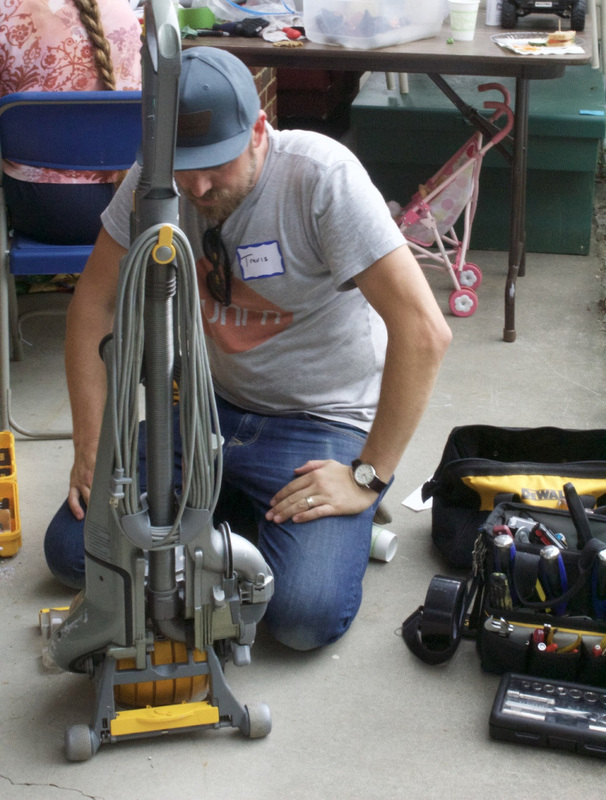 Our local Transition group had held a tiny, experimental Repair Café a few years earlier, but the logistics of a larger event seemed daunting, and we didn’t know where to start. Plus, I now had one-year-old twins at home, and taking on a huge volunteer project was not an option. So the TimeBank’s idea of raising money to hire an event coordinator sounded like a stroke of genius. Then came the really incredible part: the TimeBank wanted to hire ME to organize the Repair Café. Dream come true!! We ran a crowdfunding campaign on ioby to earn matching funds from New Dream and host two local events. That was a great way to get started. The ioby campaign helped us clarify our plans, test our messaging, and generate lots of buzz right away. And thanks to New Dream, we walked away with $2,400 to launch the Cville TimeBank Repair Café. It was exciting to be able to jump right in at a large scale, but also a little overwhelming. I spent many hours with spreadsheets of volunteers, lists of supplies, and drawings of the church auditorium where we held our first event. And wow, the emails... so many emails. Finally, it all came together. In three hours on a Sunday afternoon in November, we welcomed about 80 visitors and fixed over 100 items at our first event. Among the successfully repaired items were a broken toaster, a buttonless shirt, an unreliable vacuum, and a creaky chair. Keeping all those things out of the trash felt great, and folks were thrilled to have their stuff back in working order. But we were in for a surprise: the visitors whose stuff couldn’t be repaired were just as happy as everyone else. We all felt the magic in the room. Something way bigger than trash was happening. People were sitting down and connecting with one another over shared values. In our culture, throwing stuff away isn’t just "normal"; it’s baked right into our economic system. And it can feel a little lonely for those of us who prefer mending and saving things. Gathered together in that room full of fixing friends, it felt like a revival, and our hearts were singing hallelujah. "It can feel a little lonely for those of us who prefer mending and saving things. Gathered together in that room full of fixing friends, it felt like a revival, and our hearts were singing hallelujah." Our second event, in March 2016, was bigger than we ever imagined. The day started with a line of vacuum cleaners right out the door, and by the time it was over we’d helped 200 visitors go home happy. They brought us over 340 items, including an Olympic torch, a banjo, and 70 garden tools for sharpening. We’ve held four more community-wide events since then, with the help of additional funding from the Bama Works Fund of the Dave Matthews Band. Attendance has never topped that blockbuster second event, but our visitors are bringing more items than ever. We’ve seen a total of 827 visitors and evaluated 1,530 items. With a success rate around 80 percent, that means more than 1,200 items restored to use. And the owners of those 300 unfixable items got something valuable, too: peace of mind and a little more storage space. A sewing volunteer who’s also an occupational therapist jumping in to help repair an elderly visitor’s reaching tool. Two visitors taking a triumphant selfie with the fixer who repaired their antique camel saddle. A girl scout carefully sewing patches onto her vest with the help of a volunteer. The guy who brought in a CD player that was his dad’s last gift to him, and the volunteer who ran home to grab a spare part so he could fix it. Metal sculptor John Rubino popping over to his shop to fabricate a new part for a lamp. A dad’s face lighting up as he helped his little girl disassemble gadgets at the Take-Apart Table. Folks from the local Urban Sketchers group stopping by to draw our fixers in action. So.... Have you been dreaming of a Repair Café in your town? Here’s the good news: you don’t have to start big, and you don’t need a lot of money. It does help to visit a Repair Café if you can. Folks from the New River Valley in Virginia met with us last year and visited our event. Now, they’re getting ready to hold their second Repair Café on a budget of about $200, which they expect to cover through small donations at the event. After six events held at three different venues, our systems are running pretty smoothly. Paid planning time is down to about 40 hour per event. That means we can fund the event with small fundraisers instead of grants. It would also be manageable for a team of volunteers to take over if we decided to go that route. The two biggest time investments are volunteer management and publicity. Our publicity strategy is “everything that’s free”: online calendars, Facebook, email newsletters, press releases to local media, radio PSAs and interviews, and lots of emails to community groups. We really don’t want to grow the event any bigger, but publicity serves two purposes beyond getting attendees in the door. First, we get to promote the simple idea of fixing stuff. Every person who hears that message is one small step in the right direction. Second, we get to promote the TimeBank! 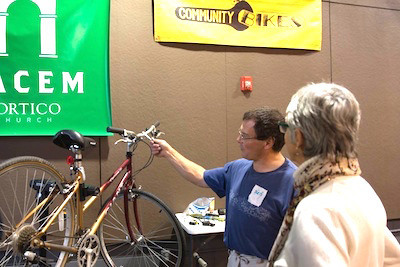 Every Repair Café event brings a wave of new TimeBank members. Moving forward, we’re starting to pilot a different format for small, neighborhood-based events that aim to serve 15-30 visitors. We’ve held one event in partnership with a local residents’ association, and all the planning and publicity took less than five hours. The super-helpful mentors at ioby taught us this: crowdfunding is not “magic money from the Internet.” Most campaigns don’t go viral, and the most successful way to get donations (by a long shot) is to ask people in person. Having a TimeBank full of folks with skills right at your fingertips is pure gold. I can’t imagine recruiting 60+ volunteers from scratch any other way. Simple is good. We’ve tried bells and whistles like live music, mini repair classes, free food, info tabling by local nonprofits, and a scavenger hunt for kids. But most of the folks who come in just want their stuff fixed. Tool sharpening is insanely popular! People will literally bring buckets of pruning shears and clippers. Online volunteer signup has saved us hours upon hours of work. We use a free Google form that also sends an automatic email when people sign up. Ann Marie Hohenberger is a freelance writer and organizer working to change the culture in Charlottesville, VA and beyond.